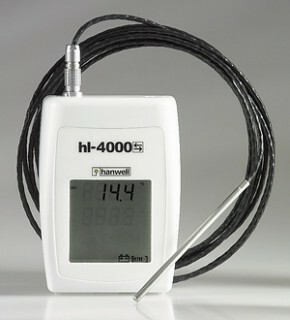 The HL4401 & HL4402 are precision 4-wire PT100 temperature measuring devices. The HL4401 has a single channel input, the HL4402 is dual channel. The sensors are connected via 5 pin Lemo plugs and sockets. Each 4000 unit reads its on-board sensors providing accurate and reliable information about environmental conditions. The sensors can be calibrated, either by the user or at our calibration laboratory. Each unit has an LCD screen simultaneously displaying the most recent readings taken and the predicted battery life. The logger has enough internal memory to store up to 100,000 readings and is in fact continually logging guaranteeing 100% validity of the data. The data can be downloaded via the high speed USB connection directly into the PC software (W200 available separately). The moulded case allows easy access to the battery and USB socket, as well as having slots to fit onto secure wall brackets (Y119 available separately).